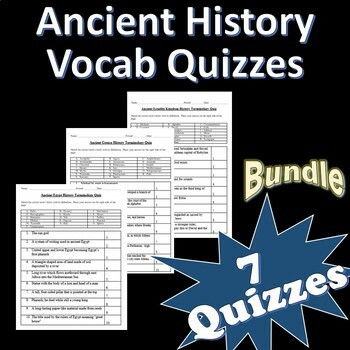 Ancient History Vocabulary Quiz Bundle: Includes 7 different vocabulary quizzes each containing 20 questions/terms. 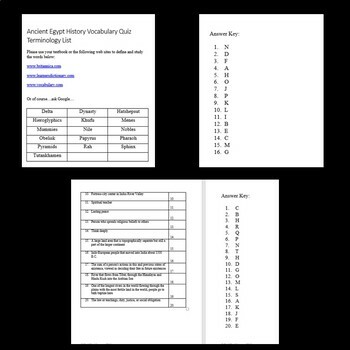 Resource comes with answer keys and offers an easy way to assess Ancient History terminology. Answer keys included. Files are Microsoft Word files and can be edited to your liking. 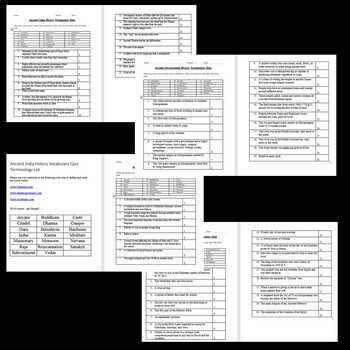 This document is for personal use only and may only be used by the original purchaser. Copying for more than one teacher, classroom, department, school, or school district is prohibited. Additional licenses can be purchased at a discount for others to use in your department. This entire document, or any parts within, may not be reproduced or displayed for public viewing. You may NOT electronically post this product online including to teacher blogs, classroom websites or school networks. Failure to comply is a copyright infringement and a violation of the Digital Millennium Copyright Act (DMCA).